It’s been a long journey. We’ve been to this country’s premier auctions and even ventured overseas to Ireland. This is our biggest class to date, and we think it’s our best. While I am anxious to get each and every one of them in the starting gate, I realize it’s a journey. Some of these horses will start late this spring or early this summer. Others we won’t even pencil in until the fall. That’s the beauty of these horses. They’ll all write their own story. We will see a tremendous progression both physically and mentally in all of these prospects in the coming months. There has never been a better time to own a racehorse, and we want you to feel the magic as these exciting prospects progress toward carrying the black and gold silks in their first start. 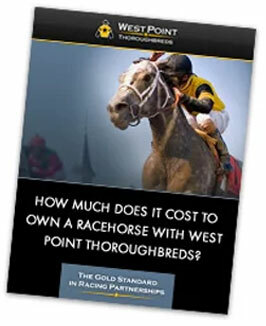 So, get on board for the journey as you get a look at what it takes to get a Thoroughbred racehorse to the highest levels of this sport. If you are anything like me, you can’t help but be excited. Sometimes the best horses have their own unique stories behind them. Everyone remembers the scar on Smarty Jones’ head from his accident as a baby. This Badge For Silver ridgling has his own unique back story. He was in the consignment of J.J. Crupi, the same man that we bought Macho Again from. He was very high on Macho Again, so we know to really take stock when he puts you on a horse. J.J. told me that he had a Badge For Silver in the barn that he really loved, but he was not getting a ton of activity among the buyers. You see, this colt had one undescended testicle that was going to need to be taken out. This is not at all uncommon, but some buyers simply decide to pass. We never disqualify a horse for something like this. A lot of people forget that one of the best racehorses and most prolific stallions of this generation, A.P. Indy, was a ridgling. 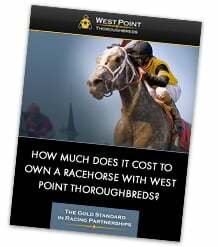 We buy athletes with the potential to get our partners into the paddock and winner’s circle at some of the nation’s best racetracks. We felt we were able to buy a talented runner for less than we normally should. We removed the undescended testicle while leaving the other testicle in tact. He shipped to Tom Albertrani’s barn at Belmont on the Friday before Memorial Day, so we’ll expect to get him legged up for a potential debut late at the Saratoga meet. Badge of Silver is a freshman sire, and we have really specialized in finding the hot young sires. As a matter of fact, our Grade 1 winner Macho Again came from Macho Uno’s first crop. Badge of Silver is already off to a strong start with a repeat winner from his first five runners. Badge of Silver was a graded stakes winner on both the dirt and the turf, so this colt could be a very versatile runner. Click here to view the Badge of Silver’s roster page. Last summer we decided to expand our operation into Canada. We had dipped our toe into the water a few years ago, and it was a great experience that included our first Queen’s Plate runner. When we looked at the purses up at Woodbine we realized that there was an untapped market that we needed to get back in on. Enduring Star had an interesting path to Woodbine. He is truly a world traveler. He was bred in Canada then ended up in the Goffs yearling sale in Ireland. As a Canadian bred, we knew he would be a natural fit for Woodbine. We shipped him across the Atlantic to David McKathan in Florida to get prepared for the track. He put in a few quarter-mile breezes and shipped to top Canadian conditioner Mark Casse earlier this month. Mark won the Canadian training title for three consecutive years. He knows good horses. When he first saw this colt in Florida over the winter he immediately took a liking to him. He took note of the playful personality that endeared him to all the barn help in Florida. Now that Enduring Star has made the transition to the track his thoughts have not changed. This colt began his official breeze schedule on May 28th when he worked a quarter-mile in company with fellow West Point two-year-old Bold Henry. He will go three-furlongs this week, and if all continues to go well he will likely debut in late July at Woodbine as we look to take Canada by storm. Click here to view Enduring Star’s roster page. The people at the Goffs yearling sale in Ireland have been working to get me to come to their sale for quite some time. Last year I finally took the plunge, and King Ting was one of the colts we bought at the sale. When I went over there, I wanted to try and find horses that we thought could succeed at the highest levels of American racing with a particular focus on horses that could also excel on the turf. King Ting had an interesting pedigree. His sire was a top two-year-old in Ireland, and we like horses that look like potential two-year-old runners. Equally, we liked the commercial appeal of his damsire, Mr. Greeley. Mr. Greeley is one of the most influential bloodlines currently in the market, and he added both speed and surface versatility to this bloodline. This colt looked like he might be a little slower to start his path toward the starting gate. He is a big colt that we always had pegged as a two-turn horse. While we loved his physical maturity we weren’t quite sure how quickly he’d come to hand. We sent him to Ocala over the winter and let him tell us when he’d be ready. As we gradually continued to increase the intensity with him he never took a step back. We sent him to trainer Dallas Stewart in early May at Churchill Downs, and he’s continued to move forward. We expect him now to debut early at the Saratoga meet. While we’ll likely put him on the dirt first time out, we look forward to seeing what he might do on the lawn. Click here to visit King Ting’s roster page. When we look at horses at sales we have to do a little bit of projecting. We’re imagining what a horse will look like when they are fully developed. We estimate when the horse will be ready to run. We analyze their conformation and pedigree to try and decide what surface a horse will run on. Our ability to successfully do this is a key to our results. Sometimes though, a horse will fool you. We bought Mr. Tribute at the March sale. We thought he was one of the handsomest sons of El Corredor that we had ever seen, and we are a big fan of El Corredor as a sire. However, we thought that this colt might be one that we’d see in the starting gate later this summer. Fast forward to May 27th, and Mr. Tribute lined up as the first member of the West Point Class of 2010 in the starting gate. Mr. Tribute had simply not missed a beat since the sale and progressed through his paces with precision. While we know this colt is destined to go longer, we realized that he had done all he could in the mornings. So, we entered him in a five furlong MSW at Churchill Downs. The hope was that he’d break well and sit off the early pace then make one big run turning for home. Well, if all wishes were horses all beggars would ride. Mr. Tribute missed the break and spotted the field several lengths in the first few yards of the race. You simply can’t do that in a five furlong sprint and expect to have any impact. Mr. Tribute did make a strong middle move, but he spent all his energy trying to catch up to the field. He ended up tiring in the stretch to finish fifth. However, the experience will set Mr. Tribute up nicely for his next start which should come at the end of the Churchill Downs meet. Click here to visit Mr. Tribute’s roster page. I mentioned, while talking about the Badge of Silver, that we take pride in our ability to identify successful young stallions before they become commercially appealing. This allows us to buy exciting athletes without having to pay a "pedigree premium". The Da Stoops colt we bought is a prime example of our buying process. This was another colt that we discovered had a small flake in his ankle. We knew it was clean, but we could pop it out before putting him into training. We gave him thirty days off then put him back under tack. He shipped to Craig Dollase at the end of April and began galloping in mid-May. Da Stoops is not exactly a household name among many racing fans. He was a California based horse that won over $600,000, but he never really broke through on the national stage. However, his bloodlines are some of the best in the business. Da Stoops is a son of Distorted Humor, one of the most commercially appealing sires in the business. This two-year-olds damsire is the great sire Nureyev, one of the most influential damsires and turf sires in the world. This colt has been a true professional since shipping to Craig Dollase. He is scheduled to begin breezing this month, and we expect him to debut late at Del Mar. Click here for the Da Stoops colt’s roster page. He’s the most well bred horse that we ever bought. That was my first reaction when I signed for this colt at the sale. My second thought was, that breeding won’t mean anything if this guy cannot run. Every sale, we bring in Dr. William Baker to vet our potential purchases. You see, the x-rays in the sales repository are those taken by the seller. While they are useful, the seller wants to use the most favorable pictures to enhance their horse’s value. By taking independent x-rays, we get the full picture of a horse’s health. We saw this colt had a few flakes in his ankles. Our examinations allowed us to see they were clean, but without this due diligence we might have been scared off. We aren’t scared in situations like this because we know what to expect. We purchased Awesome Gem under exactly the same circumstances. Now, $2 million in earnings later, Awesome Gem continues to compete in the highest level races in the country. A lot of people ask me how this colt got the name Grip Hands. I named him in honor of my West Point classmates and friends Colonel John McHugh who was killed by a suicide bomber in Afghanistan in May. At West Point, Grip Hands is a term used when there’s a fallen member of the "long grey line". John was passionate about horses. I could think of no better tribute than to honor my friend than through a special colt like this. Click here to visit Grip Hands’ roster page.